We’re all familiar with the weather forecast, but what about the air quality forecast? During the summer months, daily air quality forecast updates let the public know if it will be a green, yellow, orange or red air quality day – and each color means something different for our health. As the weather heats up and the risk for poor air quality accelerates, these forecasts can play an important role in helping individuals avoid the harmful effects of air pollution. 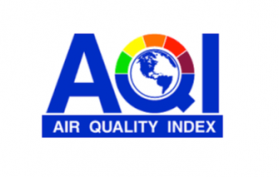 The colors represent values within the Air Quality Index (AQI), a numerical system that measures how clean or polluted the air is. The Environmental Protection Agency calculates the AQI for five major air pollutants as regulated by the Clean Air Act: ground-level ozone, particle pollution, carbon monoxide, sulfur dioxide and nitrogen dioxide. With values ranging from 0 to 500, the AQI determines health effects that may be experienced within hours or days after breathing polluted air. The higher the AQI value, the greater the level of air pollution and potential for concerns. The AQI is divided into six categories, each corresponding to a different level of health concern. Symbolized by the color green, an AQI in the 0-50 range is considered “good,” and air pollution poses little to no health risk. When the AQI ranges from 51-100, the health concern level is “moderate” and symbolized by the color yellow. In this range, air quality conditions are acceptable; however, people who are unusually sensitive to ozone may experience respiratory symptoms. When the AQI ranges from 101 to 150, air quality conditions are “unhealthy for sensitive groups” and symbolized by the color orange. People with lung disease, older adults and children are at a greater risk from exposure to ozone, while those with heart and lung disease, older adults and children are at greater risk from the presence of particles in the air. An AQI from 151 to 200 represents “unhealthy” air quality conditions and is symbolized by the color red. At this AQI, everyone may begin to experience some adverse health effects, and members of the sensitive groups may experience more serious effects. Any AQI from 201-500, is considered “very unhealthy” or “hazardous,” and can trigger negative health effects and health warnings for the entire population. The health effects of poor air quality are numerous and can include shortness of breath, coughing, wheezing, headaches, nausea, eye and throat irritation and decreased lung function. Additional risks include aggravation of respiratory problems, asthma, allergies and lung diseases; impairment of the immune system, increased hospital and ER visits and irregular heartbeat, heart attacks and premature death in those with heart or lung disease. To help keep the public updated on air quality conditions, the Clean Air Partnership posts the daily air quality forecast on our homepage. Residents can also visit the website to sign up to receive the forecast via email. Throughout the summer, the forecast can also be found on our Facebook page or by following the organization on Twitter @gatewaycleanair. 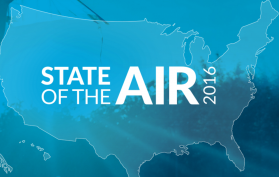 The American Lung Association’s 2016 State of the Air report ranked St. Louis as the 18th most polluted metropolitan area in the nation for ozone pollution, once again confirming what a critical concern air pollution continues to be locally. And those concerns have the potential to ramp up in the coming months, as the St. Louis area settles into its first summer season featuring stricter ozone standards. Last October, in an effort to further protect public health, the Environmental Protection Agency strengthened the National Ambient Air Quality Standards for ground-level ozone to 70 parts per billion (ppb), down from 75 ppb. With these standards now in effect, the area has the potential to see many more orange and red poor air quality days this summer. Luckily, there are a number of steps all of us can take to help reduce emissions, and keep air quality in the healthy range. Since transportation has the most profound impact on air quality, making the choice to spend less time behind the wheel is an easy way to reduce the emissions that lead to poor air quality. Actions like using transit, carpooling and vanpooling, choosing not to idle your vehicle, combining errands into a single trip, walking and biking more, telecommuting and/or adjusting work hours to stay off the road during peak commute times all help take cars off area roads and the related emissions out of our air. These actions are especially critical when poor air quality conditions are in the forecast. In addition, there are many eco-friendly lifestyle changes that can further positively impact air quality, including efforts to conserve energy, recycle, reduce waste and reuse items. Throughout the summer, area residents can view the daily air quality forecast on our homepage. Visitors can also sign up there to receive the daily forecast via email. The forecast can also be found on our Facebook page and on Twitter @gatewaycleanair. Over the years, scores of print publications have either downsized or gone out of business, creating severe losses for publishers and reporters. J.B. Lester’s The Healthy Planet magazine, however, continues its reign as the only health and environmental magazine in the Greater St. Louis area. for 18 years. In 1995, Lester left his post as co-editor and co-publisher at the Webster-Kirkwood Times with the goal of starting a new publication devoted to covering environmental and health issues. A couple years later, Lester managed to get The Healthy Planet off the ground thanks to financial help from a family member. But, as Lester recalls, the first year was a difficult one. Today, The Healthy Planet magazine is available at more than 800 locations in the Greater St. Louis area and its monthly readership has grown to 90,000. With extensive coverage every month, The Healthy Planet includes sections like “Green & Growing,” “Kids’ Planet” and “Fresh Fare” to educate readers about organic and sustainable gardens, children’s activities that highlight green living and sustainable ways to eat healthy. Other special sections such as the Summer Camp Guide, the Holiday Green Shopping Guide and the Growers & Market Guide connect readers to resources that will help them to maintain a healthy and eco-friendly lifestyle. As a result of Lester’s life-long interest in green and healthy living, he and his wife Niki practice what they preach by incorporating eco-friendly alternatives into every possible aspect of their lives at home and at the office. His family recycles, uses only energy-saving light bulbs, carpools to work often and eats primarily grass-fed, free-range meat. To lessen his carbon footprint, Lester said he has been using an electric lawn mower, a natural gas grill and organic yard and garden practices for years. Poor air quality is part of what inspires Lester to not only maintain, but also continuously improve his green lifestyle. Asthma and other respiratory illnesses have increased over the years and are directly linked to poor air quality, especially in St. Louis and the Mississippi Valley. And, asthma has played a direct role in spurring Lester’s green lifestyle, because one of his daughters suffers from sports-induced asthma. As a result, Lester said he would like to see more St. Louis area residents doing their part to improve the region’s air quality by using mass transit, bicycling, walking and driving more fuel-efficient, eco-friendly vehicles. To help his readers easily incorporate long-term, eco-friendly practices into their daily lives, Lester stresses the importance of taking small steps. That’s why each issue of The Healthy Planet is focused on introducing environmentally friendly alternatives to readers, which Lester hopes will spur greener lifestyles overall. Easy steps he promotes include starting a home recycling program, changing out light bulbs and learning more about organic gardening. To learn more about going green and helping improve the region’s air quality, visit www.cleanair-stlouis.com or call the American Lung Association of the Upper Midwest at 314-449-9149. To learn more about The Healthy Planet, visit www.thehealthyplanet.com or call (314) 962-7748.